In this new series we are bringing you ten shows, each one detailing the location or locations from a well known book. In each episode the author of that book will bring us on a tour of the areas which are relevant to them and to some of the context within the pages of their book. 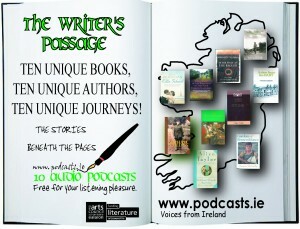 The Writer’s Passage will bring you on a journey from Sligo to Roscommon, Longford, Kilkenny, Tipperary, Antrim, Waterford, Cork, and Dublin. Just click on the links below to take you there. The Writer’s Passage is produced by All Points West Media Services.